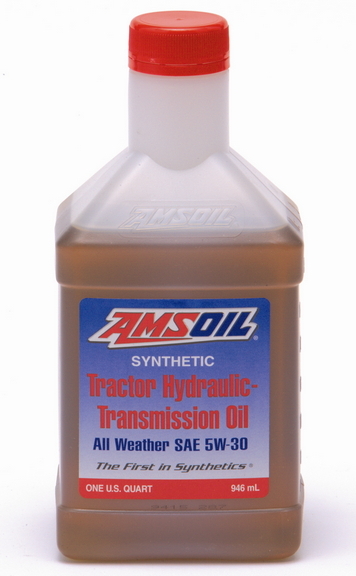 Synthetic Tractor Hydraulic/Transmission Oil SAE 5W-30 For All Weather Performance in Farm and Commercial Equipment Formulated for combinations of transmission, hydraulic systems, final drives, power take-off systems and wet brakes. Engineered specifically to meet the tough applications of heavy-duty farm and industrial equipment as well as commercial and residential lawn tractors. 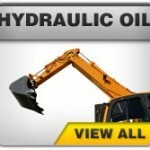 Ideal for lawn tractor hydrostatic transmissions. 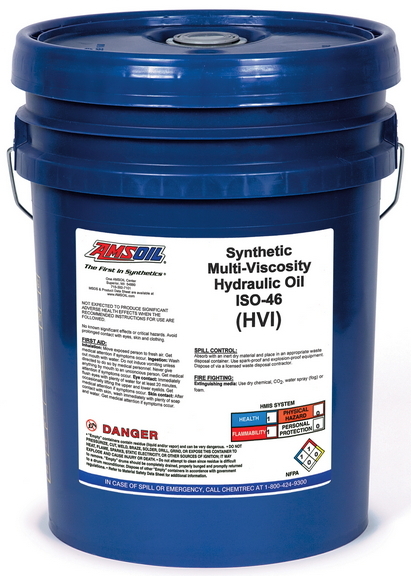 Synthetic Multi-Viscosity Hydraulic Oil - ISO 46 All-Season, Anti-Varnish, Anti-Wear AMSOIL Synthetic Multi-Viscosity Hydraulic Oil's blend of high-viscosity-index base oils and performance additives provides all-season protection and reliable operation in all types of hydraulic systems. 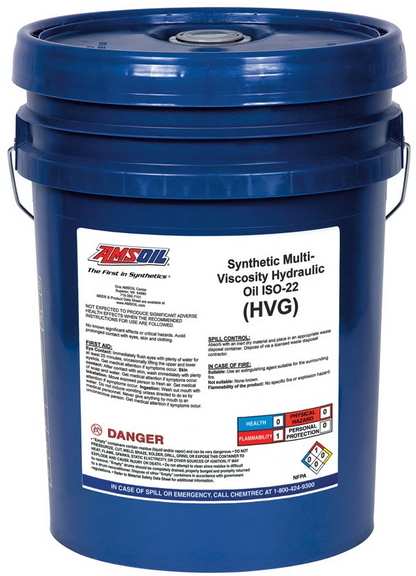 Synthetic Multi-Viscosity Hydraulic Oil - ISO 68 All-Season, Anti-Varnish, Anti-Wear AMSOIL Synthetic Multi-Viscosity Hydraulic Oil's blend of high-viscosity-index base oils and performance additives provides all-season protection and reliable operation in all types of hydraulic systems. Synthetic Multi-Viscosity Hydraulic Oil - ISO 32 All-Season, Anti-Varnish, Anti-Wear AMSOIL Synthetic Multi-Viscosity Hydraulic Oil's blend of high-viscosity-index base oils and performance additives provides all-season protection and reliable operation in all types of hydraulic systems. 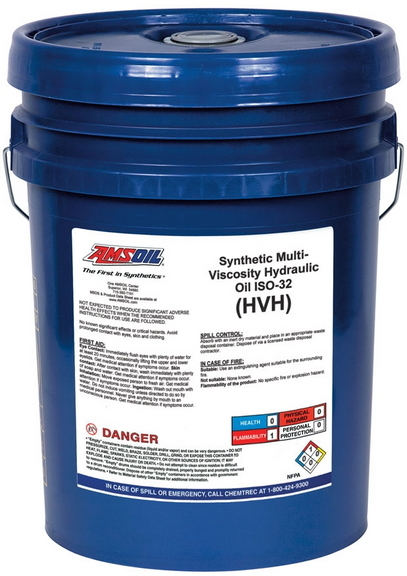 Synthetic Multi-Viscosity Hydraulic Oil - ISO 22 All-Season, Anti-Varnish, Anti-Wear AMSOIL Synthetic Multi-Viscosity Hydraulic Oil's blend of high-viscosity-index base oils and performance additives provides all-season protection and reliable operation in all types of hydraulic systems. 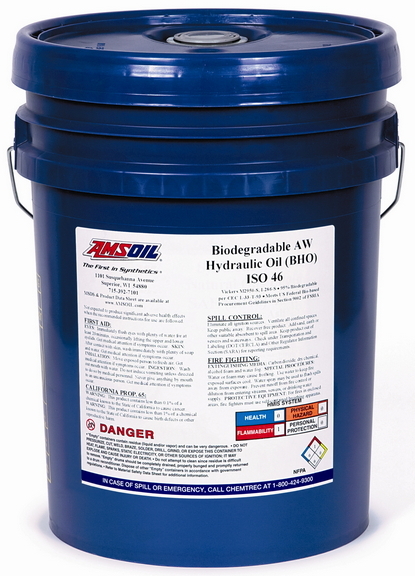 Biodegradable Hydraulic Oil ISO 46 Provides Outstanding Protection and High Biodegradability AMSOIL Biodegradable Hydraulic Oil is a premium performance hydraulic oil designed to biodegrade when subjected to sunlight, water and microbial activity. Manufactured with a high quality blend of oleic vegetable oils and customized synthetic esters, it meets the U.S. Federal bio-based procurement guidelines as defined in Section 9002 of the Farm Security and Rural Investment Act of 2002 (FSRIA). 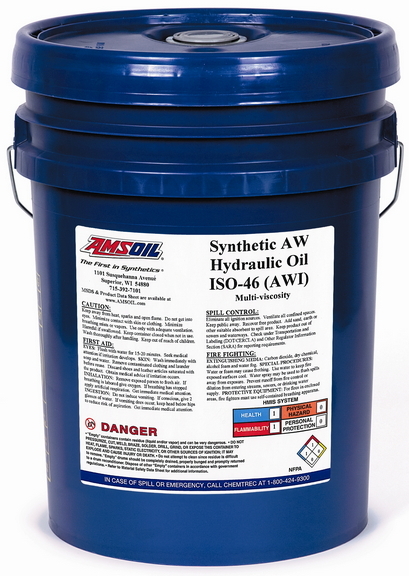 Synthetic Anti-Wear Hydraulic Oil - ISO 46 Protects hard-working hydraulic systems from the stress of high-pressure, high-load and heavy-duty operations. Remains fluid in cold temperatures for immediate cold-weather flow. Special anti-wear additives and rust inhibitors provide optimum protection to expensive equipment. Synthetic Anti-Wear Hydraulic Oil - ISO 32 Protects hard-working hydraulic systems from the stress of high-pressure, high-load and heavy-duty operations. Remains fluid in cold temperatures for immediate cold-weather flow. Special anti-wear additives and rust inhibitors provide optimum protection to expensive equipment. Synthetic Anti-Wear Hydraulic Oil - ISO 22 Protects hard-working hydraulic systems from the stress of high-pressure, high-load and heavy-duty operations. Remains fluid in cold temperatures for immediate cold-weather flow. Special anti-wear additives and rust inhibitors provide optimum protection to expensive equipment.